My Sago palm usually loses its lower leaves then sprouts new ones. It never has more than two rows. I have had it for over ten years. This year, however, it sprouted these enormously large fronds, which the leaves are spread apart from one another more so than usual and only half curled out. They have to be about 4' tall in a week or two. What is this and do I cut them? 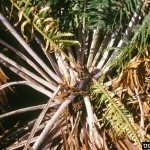 A regular fertilizer schedule is important for the health of you Sago Palm. Here are a few links that will help you.